You are here: Home > MCSD News & Alerts > MCSD News & Alerts > Jefferson News > Jefferson Time Capsule Display Comes Home to Jefferson! After being out on loan for display at the Muscatine Art Center, the Jefferson School “Time Capsule” and the contents found inside are back at Jefferson Elementary. 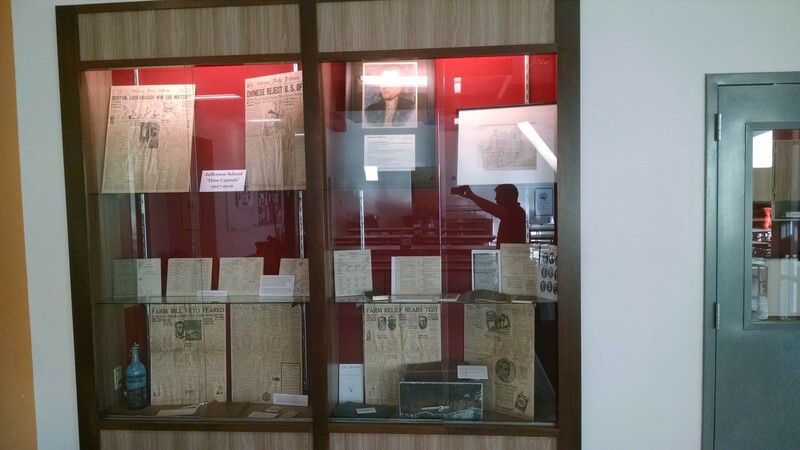 Items from the “Time Capsule,” including newspapers, telephone books, and other documents may now be seen in the main display case outside the Main Office at Jefferson School. Items will be on display through the end of November, when they will again be stored to help preserve their condition for future generations. Visitors are welcome to view the artifacts on display at Jefferson Elementary School during normal school hours of 8:00 am – 3:00 pm. All visitors must check in at the Main Office.